Anacharis or Elodea as it’s less commonly known can be seen in many aquariums. 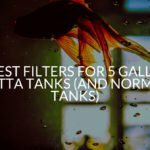 However, if you’ve just got a betta tank you may be wondering if it’s suitable. Betta’s are hardy fish so most plants aren’t a problem. However, every once in a while there are some plants that just don’t work well with bettas. Keep reading to find out whether you should keep anacharis and bettas together in the same tank! 2 What Does Anacharis Look Like? 4 Do Bettas Like Anacharis? Anacharis is a plant that originates in South America. More specifically Brazil, Uruguay, and Argentina. However, due to it’s hardiness as a plant you can now find it over South America and North America! It’s a very interesting plant that exhibits some unique behavior. 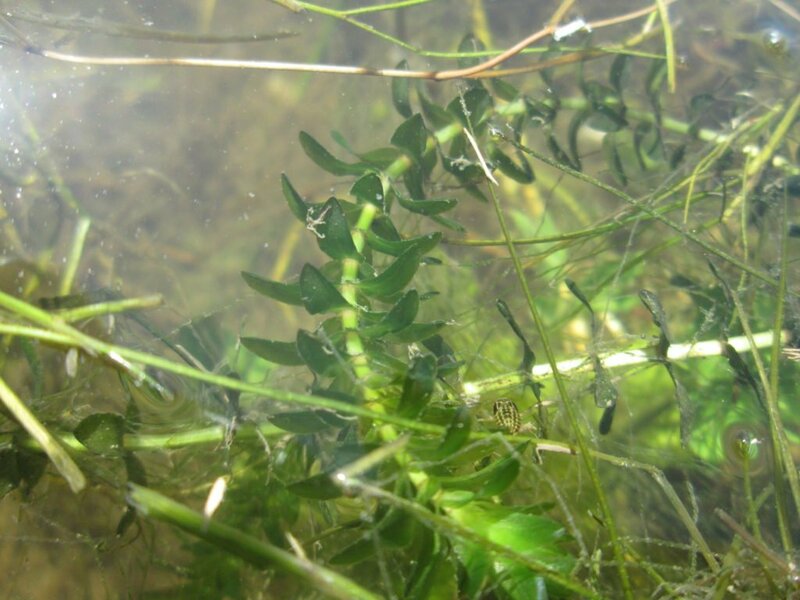 In the day when it’s warmest you’ll notice anacharis floating to the surface of the water, there it will absorb as much of the suns light and heat as possible. When it turns to night and things get darker it begins to float down where it can rest ready for the next day. Anacharis can be found in a variety of different habitats including lakes, ponds, streams, rivers, and canals. The key for it to grow well, however, is slow moving current. 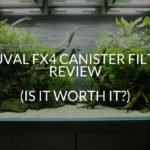 It’s used so often in aquariums because it’s so low maintenance and easy to take care of! What Does Anacharis Look Like? Anacharis is a long green stem that is covered in spirals of leaves. It’s quite similar to hornwort which is another great plant you can add to betta fish tanks! At the bottom of anacharis there may be only 3 leaves, but as the stem approaches the top it’s more common to see 5-6 leaves together at a time. And while the leaves aren’t very big, the plant itself is. 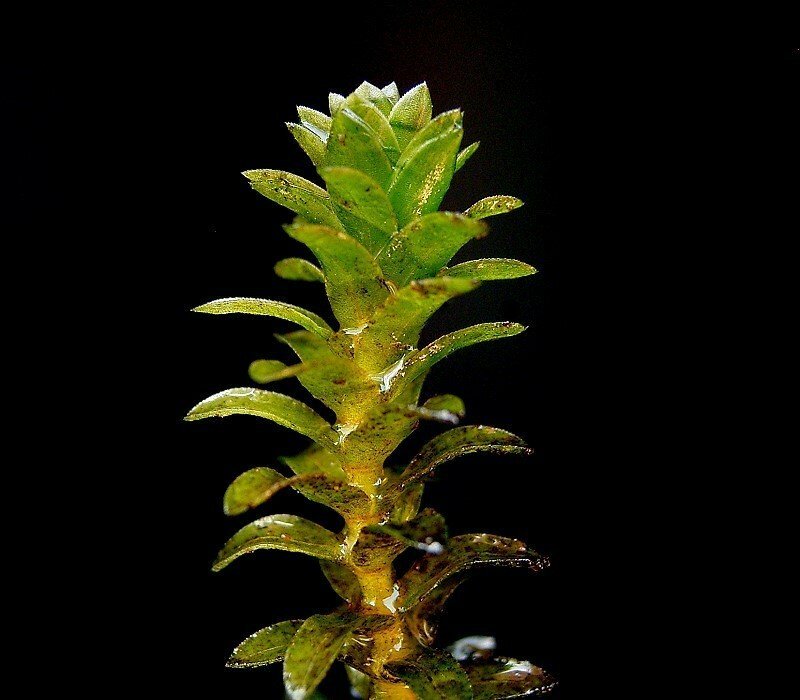 You’ll notice the leaves on anacharis only grow up to 4cm. However, if left untrimmed the stem can grow up to 3 feet in size. So make sure you’re trimming it often! If left untrimmed it’s also going to grow extremely long. If you plant it and leave it to grow then it will grow to the top of your tank, spread out and then grow back down. 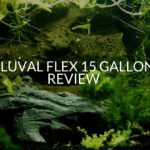 This can be a great way to give your tank a more jungle-like look that your betta will love. Color wise it comes in a different variety of green from light to dark. The color of anacharis depends on the water conditions in your tank and how much light it’s getting. Interestingly, in summer months if the conditions in your tank are good you’ll notice a small white flower blooming from the end of the plant. This will only happen if the flower is able to bloom out of the water, or if it’s partially submerged. Stems that are sturdy, green and covered in leaves. No leaves that are brown or dark green. Also avoid leaves that are black, because that means they’re dead or dying. Make sure the plant is drooping too much, or that it looks like it can’t support its own weight. Don’t worry too much if you don’t see any roots on anacharis when you’re buying it. They normally get cut off, but will grow again once you bury the anacharis in the substrate. You know a little bit about anacharis now, but you also need to make sure that your betta is going to like it. There are a few good reasons why your betta will love anacharis (but one where he won’t). Obviously, you’re going to want to make sure your betta has somewhere to hide so he can rest. When you place a bunch of anacharis together in your tank it’s going to make a dense jungle. Your betta can hide in that jungle when he needs to rest and be away from other fish. Bettas need a lot of entertainment to stop them from getting bored. One thing you can do is keep the tank interesting by giving him places to explore. If you place a bunch of anacharis in the tank he can spend his time swimming through it and exploring. 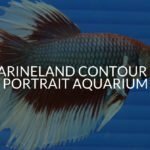 While your betta won’t specifically like this, it is going to benefit him. Anacharis requires a lot of nutrition from the water which makes it harder for algae to grow. On top of that, it also secrets a chemical that inhibits the growth of algae in the tank. 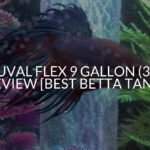 While a lot of people are fine using anacharis in their tank, some people do report that it damages their betta’s fins. It should be fine to add anacharis to your tank because this rarely happens. If you do notice your bettas fins seem to be fraying, then you should remove the anacharis from the tank and see if the condition improves. 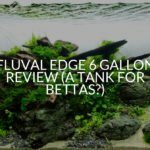 Luckily, if you plan on adding anacharis to the tank with your betta, you don’t need to change the conditions of the tank too much. In fact, in most cases, the conditions are going to be just right already. 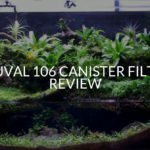 When buying any plant or fish for your tank you need to be aware of the pH, temperature, and lighting they need. If you don’t do this then you could cause their immune system to weaken. And in some cases, they may also die. First of all, is the temperature in the tank. Bettas love a temperature as close to 78°F as possible. 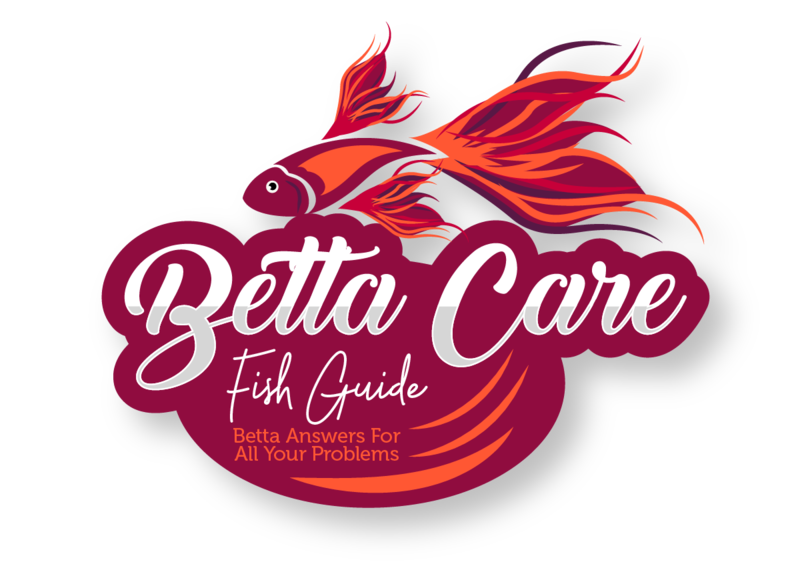 But as long as the temperature is between 76-80°F and not fluctuating then your betta will be just fine. Anacharis is a lot more flexible when it comes to the temperature of the tank. While ideally, it prefers a temperature between 70-78°F, it will also survive in temperatures that are between 60-82°F. When you have a betta tank you want to keep the pH as close to 7 as possible. However, if you find it hard to get your water neutral then it’s preferable to have a tank that’s slightly acidic, but not past 6.5. Anacharis also prefers water that is completely neutral. However, they have the added benefit of being able to live in water which is slightly alkaline and slightly acidic. So just make sure that your water is as close to 7 as it can be and try to avoid alkaline conditions. When it comes to lighting it’s important to make sure there’s a moderate amount. If there’s not enough then your anacharis won’t be able to photosynthesize enough and then it will slowly die off. However, if you make the lighting too strong, while it may be fine, it may also cause an increase of algae to bloom in the tank. If you’re not sure how strong the lighting should be then generally 2 watts per gallon is a good place to start. And you should also make sure you’re turning the light off at night to give your betta a chance to rest. 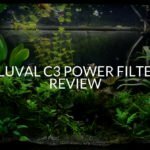 You can read more about a bettas lighting needs in this article. Anacharis is an easy plant to care for and that’s why it does so well in beginner and expert tanks alike. However, it’s always good to make sure you’re taking good care of it anyway. The biggest thing that you need to watch out for is the growth. Anacharis is not going to stop growing to match it’s surrounding. if you let it, it’s going to grow completely out of control, and take over most of the tank. The most common causes of rapid growth is when the anacharis is close to a lot of light, or when it’s planted in nutrient rich substrate. Make sure if your anacharis is getting out of control you’re trimming it regularly. If you’ve got the conditions right you’re going to notice the growth rate of your anacharis exploding. However, if the conditions aren’t as good it’s going to take longer for it to grow. If you think you’d like to keep some anacharis with your betta the only thing left to do is plant it. First of all, unbunch the anacharis and remove any bands that may be tying them together. Once you’ve done this, inspect the anacharis once more. You should be looking for any parts of the plant that seem damaged or dying. If you spot anything then cut it off with some scissors. It’s most likely to occur around the stem of the plant where a rubber band has been. Next up, cut any leaves that are a couple of inches from the bottom of the anacharis. Once you’ve done this, plant your anacharis a couple of inches deep in the substrate. When you’re planting anacharis make sure you’re leaving at least an inch of space between each plant. If you don’t then they’ll begin fighting for nutrients and they’ll all become weak or die. And of course, because of the way anacharis can grow quickly you should plant it near the back of your tank. That way you’re going to get the jungle effect of the plant, but you’re also going to be able to see everything in your tank still. Or, it’s also possible just to let your anacharis float in the tank. It will normally stay near the top and absorb light and nutrients from the water. 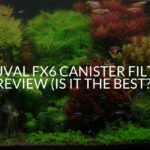 Keeping anacharis and bettas together is going to be great for you if you’re a beginner betta owner, or if you’re more experienced and looking for a great plant for your tank. 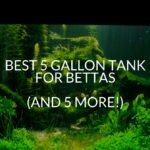 Here are some of the main points you should remember when growing anacharis in a betta tank. Healthy anacharis will be green and shouldn’t have any damage on it. It should also not show any signs of browning or blackening. The plant should also look like it’s supporting its own weight well and not wilting. However, often anacharis won’t have roots when you buy it. This is perfectly normal and doesn’t mean it’s unhealthy. Anacharis is great for betta tanks because it gives them plenty of places to hide and explore. As well as that it’s going to reduce the amount of algae growing in the tank. One thing you need to watch out for when keeping anacharis and bettas together is that their fins aren’t being damaged. If the temperature and pH in the tank are good for your betta, then they’re going to be good for anacharis. The only real maintenance anacharis is going to need is frequent trimming. When planting anacharis you’re going to need to make sure you cut the leaves off the bottom two inches of the plant. You can then plant the bottom into the substrate. Likewise, anacharis does just fine floating in your tank as well! Ig you have any more questions leave them below, otherwise have a great day.